You have proved to be a very prolific writer and author, having written more books already than most writers have written in a lifetime. What is it that keeps you going, and where do you find your topics from? How long does it take to write one book? Thanks for the interesting question, Deepti. All I can say is that my mind is extremely fertile. It can travel anywhere and imagine anything and everything. At times, I imagine myself to be a child and enjoy the colours in the canvas of a child’s mind. I wonder what a child would love to listen to. Often, I also travel back in time and connect to that. I love the child's world, full of adventure and amusement. These are the times when my children’s stories are born. At other times, I believe that I am a teen, full of dreams, living in a world of fantasy. What would happen to those dreams as I grow up? Having seen life from close quarters, I can very well comprehend a teeny mind, and during such moments, fantasy stories are created. I love to be a youth too. I certainly was very romantic and I let this romance permeate my mind and love stories are coloured by my pen. Then, there are moments I wish to remember forever and paint them with words. These are the poems, which are often small stories in themselves. At times, I have seen my stories erupting from some newspaper items also. For example, one of my novels titled In the flickering of an eye, which shall soon be published by LiFi Publications blossomed this way. I was reading the newspaper and came across a news item in which the father desired to kill his daughter, since she had fallen in love with a boy of the same gotra. This amused and petrified me at the same time and this novel was crafted. 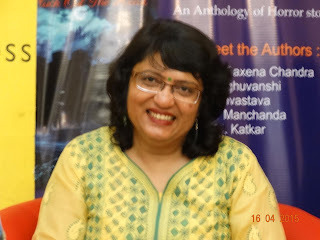 Basically, my stories are always woven from incidents and anecdotes in and around me, but in a world of my imagination and characters from my fancy. Thank you for your detailed and interesting answer, Ma'am!